The TR03 Trolley comes in beautiful Chocolate and offers your employees a great way to keep supplies and tools handy and organized. 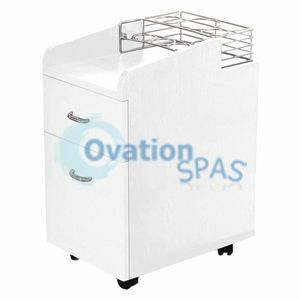 This trolley has two pull out drawers, a side basket and a removable top wire station that can hold bottles or other items. Your technicians will love the quick and easy ability to stay on top of their work supplies and you will love the convenience of rolling carts that travel everywhere with ease. The beautiful White finish blends with most decors, and the stylish structure does not conceal the fact that this particular model is extremely well made and durable. Built to last and with the highest quality materials, Whale Spa's TR03 is the ultimate rolling trolley for your spa employees and customers. Try it and find out how easy it can be to keep everyone rolling and organized. Dimensions: L 17" x W 12" x H 23"